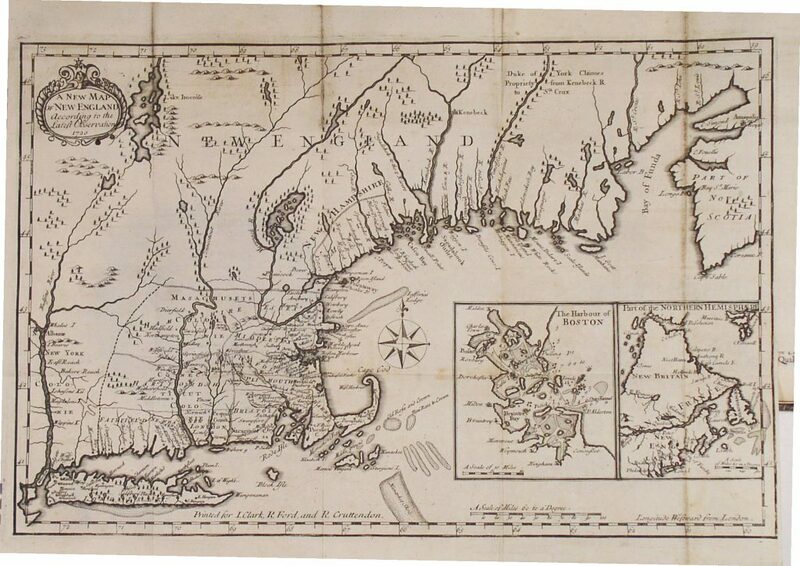 This article is the first in a series describing some key themes and important milestones in the early mapping of Massachusetts. Though most of the information may be found in other sources, to our knowledge this is the first time such a synthesis has been attempted. 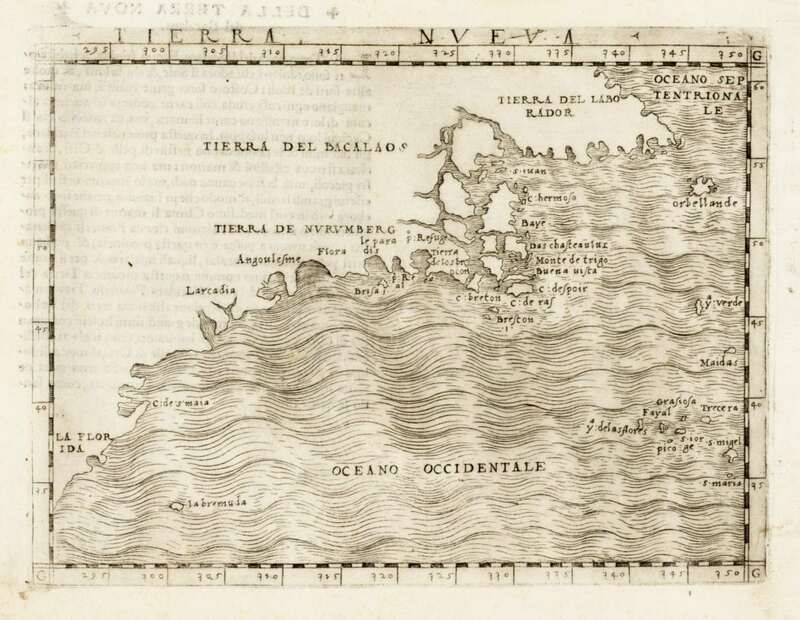 In 1548 Giacomo Gastaldi issued Tierra Nueva, the first regional map of northeast North America (fig. 1). Gastaldi’s depiction of southern New England is based on Giovanni da Verrazano’s 1524 voyage along the East Coast, during which he sailed through Vineyard and Nantucket Sounds and rounded Cape Cod. Nonetheless, Massachusetts is nowhere to be seen on the map; rather, the coastline transitions directly from Narragansett Bay (“p. Refuge”) to Cape Breton (“Tierra de los breton”). Later 16th-century maps show a similarly truncated view of the region. The first maps of specific Massachusetts locations were separate charts of Gloucester, Plymouth, Nauset and Stage Harbors issued by Champlain himself in1613. These little charts show soundings, shore outlines and some terrestrial features and are surprisingly accurate considering the difficult circumstances under which they were produced. In 1629 the Company of Massachusetts Bay obtained from Charles I a charter to the territory between the Merrimack and Charles Rivers. The “Great Migration” began the next year, and by 1640 the Colony’s population approached 20,000 persons in numerous towns across the Bay region. 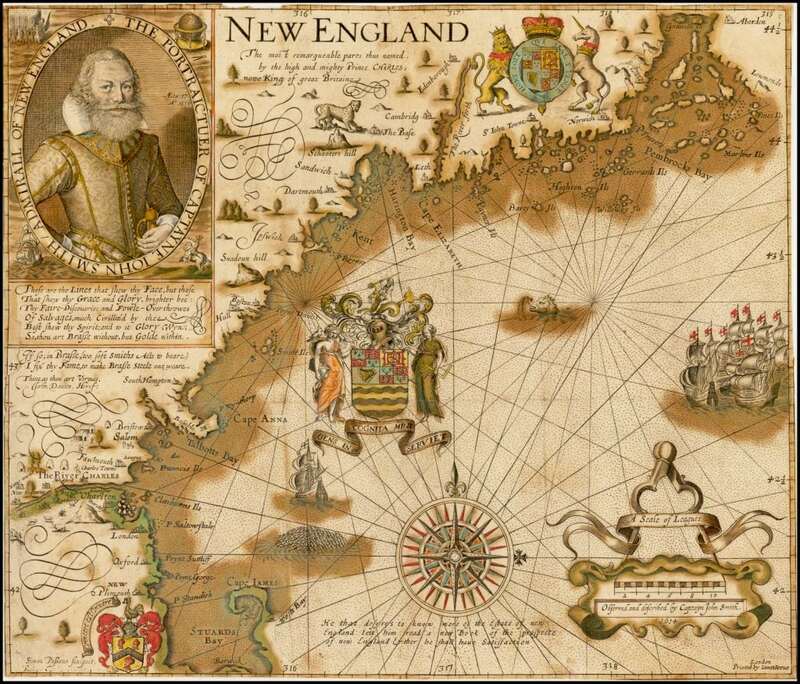 The first map to use the name “Massachusetts” was Hessel Gerritsz’ Nova Anglia, Novum et Virginia (1630). Whether this refers to the new Colony or the native American tribe inhabiting the Charles and Neponset River basins is unclear. Though crudely executed, maps by two colonists give by far the best early depiction of Massachusetts’ interior geography and the new English towns. William Wood’s The South part of New-England (1634) shows eastern Massachusetts, including the complex coastal geography and the system of rivers emptying into Massachusetts Bay. This is also the first map to locate Boston, Cambridge (“New town”), Charlestown, Dorchester, Medford (“Meadford”), Roxbury, Saugus, Watertown and Weymouth (“Wessaguscus”). John Foster’s A Map of New-England (1677) depicts New England as far north as the White Mountains and just west of the Connecticut River and documents the rapid expansion of the Massachusetts colony. Foster locates dozens of towns, including the first appearances of many towns in what are now the western suburbs of Boston and along the Connecticut River (fig. 4). For many years maps gave no indication of Massachusetts’ extent or its borders (Indeed, many maps of the time ignored the individual New England colonies altogether and instead grouped them under the broad rubric “New England” or “Nova Anglia.”) The first to depict inter-colonial boundaries were John Seller’s A Mapp of New England (fig. 5) and Robert Modern and William Berry’s A Map of New England New Yorke New Jersey Mary-Land & Virginia… (1676). Both were based on a manuscript map compiled in 1665 by one William Reed for the Massachusetts General Court. When a 1652 expedition revealed that the Merrimack made a sharp northward turn and had it source in Lake Winnipesaukee, Massachusetts interpreted the Charter as implying a northern border along a line of latitude running through the Lake. This brought Massachusetts into conflict with proprietors of lands in Maine and New Hampshire, and the Reed map was intended to bolster Massachusetts’ claim before the Crown. Though neither the Seller nor the Morden and Berry maps show an exact northern border, they clearly extend the Massachusetts Colony northward to or even beyond Lake Winnipesaukee. To the South, the border with the Plymouth Colony is shown on both maps as a concave curve extending from the North end of Plymouth Bay to a point below Springfield on the Connecticut River, which forms the western border. John Foster’s 1677 A Map of New-England, also based on the Reed map, depicts a clear northern border with a bold black line running East-West through Lake Winnipesaukee, complemented by one just south of the head of the Charles. The western border is left indeterminate, but clearly lies somewhere well beyond the Connecticut River. Daniel Neal’s 1720 A New Map of New England According to the Latest Observation (fig. 6) shows Massachusetts much nearer its modern configuration. The northern boundary is shown at a line of latitude running West from a point a few miles North of the Merrimack’s mouth. The colony is shown extending westward to roughly the present-day border along the Taconic Range. To the South, it now includes the territory of the Plymouth Colony, which had been annexed in 1691. 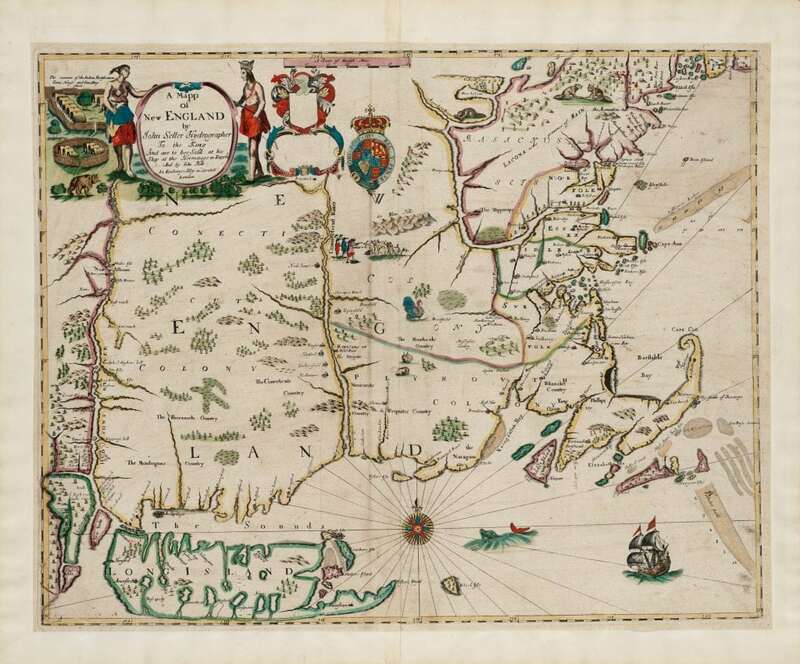 The source of Neal’s map is not clear, however, as it predates by many years the various agreements that established Massachusetts’ boundaries with its neighbors. 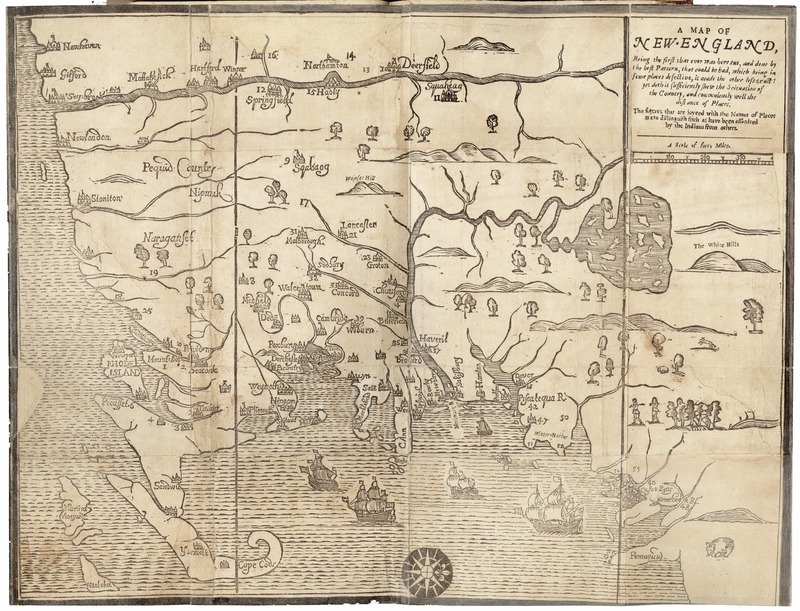 This article has examined the first century of attempts to map Massachusetts. During that time the emphasis shifted from piecing together the geography of eastern new England, to documenting the early years of settlement, and finally to supporting Massachusetts’ aggressive territorial claims. Part II of this series will look at the cartographic history of Massachusetts in the late colonial and early statehood periods. It will document how the emphasis of mapping efforts shifted once again, as maps evolved into a critical administrative tool both produced and employed by the State.